1 Place the strawberries, mango, pears and almond milk in a blender, or smoothie maker, and wiz. 3 Then place the kiwi on one side of the bowl, the pineapple on the other side of the bowl and the blue berries in the middle. 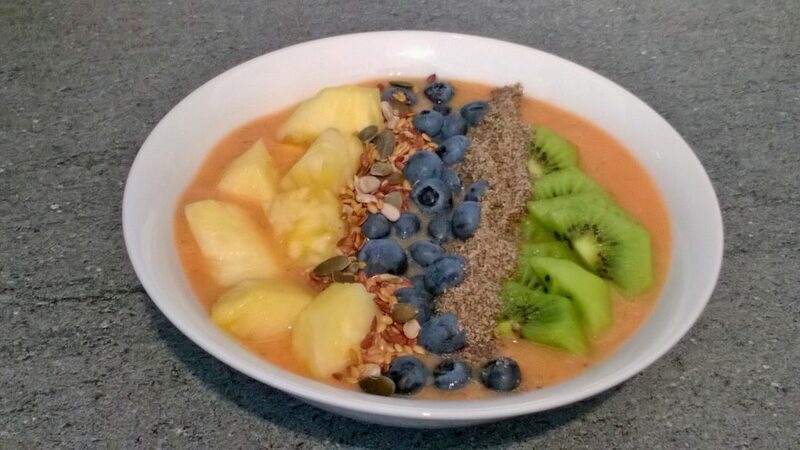 4 Then place the chia seeds between the kiwi fruit and the pineapple and the mixed seeds between the pineapple and the blueberries (you can arrange them however you like). 5 Then serve and enjoy a nutritious breakfast.